The grounds of Korea's Buryeongsa Temple. Korean Buddhism is distinguished from other forms of Buddhism by its attempt to resolve what it sees as inconsistencies in Chinese Mahayana Buddhism. Early Korean monks believed that the traditions they received from China were internally inconsistent. To address this, they developed a new holistic approach to Buddhism. This approach is characteristic of virtually all major Korean thinkers, and has resulted in a distinct variation of Buddhism, which Wonhyo (617–686) called the Tongbulgyo ("interpenetrated Buddhism"). Korean Buddhist thinkers refined their Chinese predecessors' ideas into a distinct form. Korean Buddhism today consists mostly of the Seon lineage. Seon has a strong relationship with other Mahayana traditions that bear the imprint of Chinese Ch'an teachings, as well as the closely related Japanese Zen. Other sects, such as the Taego, the modern revival of the Cheontae lineage, and the newly formed Won, have also attracted sizable followings. Buddhism, originally introduced to Korea from China in 372, or about 800 years after the death of the historical Buddha, encountered the indigenous religion Shamanism. Seen has harmonious with the rites of nature worship, Buddhism blended with Shamanism. Thus, the mountains, believed the residence of spirits in pre-Buddhist times,became the sites of Buddhist temples. Korean shamanism held three spirits in especially high regard: Sanshin (the Mountain Spirit), Toksong (the Recluse) and Chilsong (the Spirit of the Seven Stars, the Big Dipper). Korean Buddhism accepted and absorbed those three spirits and, even today, monks set aside special shrines for them in many temples. The Mountain Spirit receives particular recognition in an attempt to appease the local mountain spirits, on whose land the temple stands. That blend of Buddhism and Shamanism became known as Korean Buddhism, although the fundamental teachings of the Buddha remained. Though it initially enjoyed wide acceptance, even being supported as the state ideology during the Goryeo period, Buddhism in Korea suffered extreme repression during the Joseon Dynasty, which lasted for several-hundred years. During this period, Neo-Confucian ideology overcame the prior dominance of Buddhism. Only after Buddhist monks helped repel a Japanese invasion at the end of the sixteenth century (see Seven-Year War) did the persecution of Buddhism and Buddhist practitioners stop. Buddhism in Korea remained subdued until the end of the Joseon period, when the Japanese strengthened its position during the occupation, which lasted from 1910 to 1945. After World War II, the Seon school of Korean Buddhism once again gained acceptance. With the increasing influence of Christianity in Korea, the religious population among self-professed Buddhist community in South Korea has declined to an estimated 23 percent of the country's population. In officially atheist North Korea, Buddhists make up an estimated 2 percent of the population. Buddhist missionaries introduced Buddhism to the Korea Korean peninsula during the fourth century C.E., at the time of Three Kingdoms: Goguryeo in the north, Baekje in the southwest, and Silla in the southeast. Goguryeo. In 372 the Former Qin ruler Fujian (符堅) sent the Chinese monk Sundo (順道, or Shundao in Chinese) to the court of the King Sosurim (小獸林) of Goguryeo. He brought Chinese texts and statues with him and the Goguryeo royalty and their subjects quickly accepted his teachings. The Buddhism in China took a rudimentary form, consisting of the law of cause and effect and the search for happiness. That had much in common with the predominant Shamanism, which likely led to the quick assimilation of Buddhism by the people of Goguryeo. Baekje. In 384, the Serindian monk Maranant'a arrived in Baekje and the royal family received the similar strain of Buddhism he brought. King Asin proclaimed, "people should believe in Buddhism and seek happiness." Gaya. A small, separate federation, Gaya, emerged for a short time on the southern coast between Baekje and the fast growing Shilla. Gaya fell to Silla during the mid-sixth century. Buddhism entered the kingdom of Silla during the 5th century, attracting the common people but resistance among the aristocrats. In 527, however, a prominent court official named Ichadon presented himself to King Pophung and announced he had become Buddhist. The king had him beheaded, but when the executioner cut off his head, legend states that milk poured out instead of blood. Haeinsa houses Paintings of that and the National Museum of Kyongju preserves a stone monument honoring his martyrdom. During the next reign, King Chinhung encouraged the growth of Buddhism, leading to its establishment as the national religion of Silla. Additionally, selected young men received martial and spiritual training at Hwarangdo according to Buddhistto principles to defend the kingdom. King Chinhung later became a monk himself. Many Korean Buddhist monks traveled to China to study the buddhadharma in the Late Three Kingdoms Period, especially in the late sixth century. Sources state that the monk Banya (波若; 562-613?) studied under the Tiantai master Zhiyi, and Gyeomik of Baekje (謙益;) travelling to India to learn Sanskrit and study Vinaya. Monks of the period brought back numerous scriptures from abroad and conducted missionary activity throughout Korea and Japan. Although the date of the first mission to Japan remains unclear, Japanese rulers in 577 reportedly invited a second detachment of scholars to Japan. The strong Korean influence on the development of Buddhism in Japan continued through the Unified Silla period. During the eighth or ninth century Japanese monks began independent study in significant numbers. Several schools of thought developed in Korea during those early times: *the Samnon (三論宗, or Sanlun in Chinese) school focused on the Indian Mādhyamika (Middle Path) doctrine, *the Gyeyul (戒律宗, or Vinaya in Sanskrit) school taught the study and implementation of moral discipline (śīla), while *the Yeolban (涅槃宗, or Nirvāna in Sanskrit) school, taught basic themes of the Mahāparinirvāna-sūtra. Korean monks formed the Wonyung (圓融宗, or Yuanrong in Chinese) school toward the end of the Three Kingdoms Period. That lead to the actualization of the metaphysics of interpenetration as found in the Huayan jing(華嚴經), soon considered the premier school, especially among the educated aristocracy. That school later became known as Hwaeom (華嚴宗, or Huayan in Chinese), the longest lasting of those "imported" schools with strong ties to the Beopseong (法性宗), the indigenous Korean school of thought. Sources credit the monk Jajang (慈藏)with having been a major force in the adoption of Buddhism as a national religion. Jajang gained renown for for his participation in the founding of the Korean sangha, a type of monastic community. Won-hyo stands out as another great scholar to emerge from the Silla Period. He renounced his religious life to better serve the people and even married a princess for a short time and had a son. He wrote many treatises and his philosophy centered on the unity and interrelatedness of all things. He set off to China to study Buddhism with a close friend, Ui-sang, but only made it part of the way there. Legend states that Won-hyo awoke one night very thirsty, found a container with cool water, drank, and returned to sleep. The next morning he saw the container from which he had drunk was a human skull and he realized all enlightenment depended on the mind. He saw no reason to continue to China, so he returned home. His companion, Ui-sang, continued to China and after studying ten years, offered a poem to his master in the shape of a seal that geometrically represents infinity. 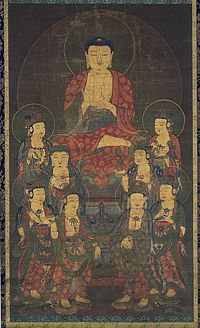 The poem contained the essence of the Avatamsaka Sutra. 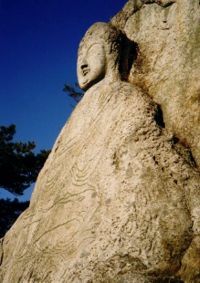 A stone image of a Buddha, near Gyeongju, South Korea. Seventh-century Silla. Wonhyo's friend Uisang (義湘) went to Changan, where he studied under Huayan patriarchs Zhiyan (智儼; 600-668) and Fazang (法藏; 643-712). When he returned after 20 years, his work contributed to Hwaeom and became the predominant doctrinal influence on Korean Buddhism, together with Wonhyo's tong bulgyo thought. 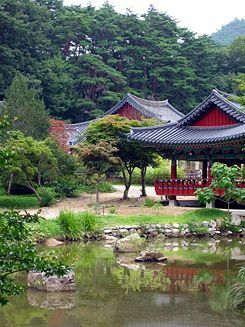 Hwaeom principles deeply assimilated into the Korean meditational school, the Seon school, where they made a profound effect on its basic attitudes. Influences from Silla Buddhism in general, and from those two philosophers in particular, even crept "backwards" into Chinese Buddhism. Wonhyo's commentaries proved extremely important in shaping the thought of the preeminent Chinese Buddhist philosopher Fazang, and Woncheuk's commentary on the Saṃdhinirmocana-sūtra-sūtra had a strong influence in Tibetan Buddhism. 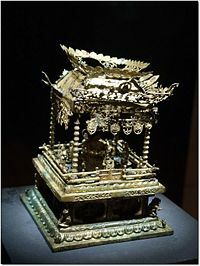 As the case in Tang China, as well as the Nara and early Heian period in Japan, both roughly contemporary to the Silla period, the intellectual developments of Silla Buddhism also brought with them significant cultural achievements in many areas, including painting, literature, sculpture, and architecture. During that period, Buddhist built many large and beautiful temples. The temple Bulguksa and the cave-retreat of Seokguram stand out as (石窟庵) two crowning achievements. Bulguksa became especially famous for its jeweled pagodas, while Seokguram earned fame for the beauty of its stone sculpture. A new epoch in Korean Buddhism began during the latter Silla period with the birth of schools of Seon in Korea. In China, the movement toward a meditation-based view of practice, earning the name chan, had begun during the sixth and seventh centuries, and before long the influence of the new meditational school reached Korea, then known as Seon. Meaning "meditation," the term became more widely known in the West in its Japanese variant Zen. Tension developed between the new meditational schools and the previously existing academically oriented schools, described by the term gyo, meaning "learning" or "study." Beomnang (法朗; fl. 632-646), considered a student of the Chinese master Daoxin (道信; 580-651), generally has been credited with the initial transmission of Seon into Korea. Seon became popularized by Sinhaeng (神行; 704-779) in the latter part of the eighth century and by Doui (道義; d. 825) at the beginning of the ninth century. From then on, many Koreans studied Chan in China, and upon their return established their own schools at various mountain monasteries with their leading disciples. Initially, the number of those schools had been fixed at nine, Korean Seon the term for the "nine mountains" (九山 or gusan) school at the time. 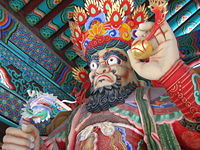 Eight of those came from the lineage of Mazu Daoyi (馬祖道一; 709-788), established through connection with either him or one of his eminent disciples. The Sumi-san school, founded by Ieom (利嚴; 869-936) and developed from the Caotong (曹洞) lineage, stands out as the one exception. Initially, the established doctrinal schools regarded the new Seon schools as radical and dangerous upstarts. Thus, the early founders of the various "nine mountain" monasteries met with considerable resistance, repressed by the long influence in court of the Gyo schools. The struggles which ensued continued for most of the Goryeo period, but gradually the Seon argument for the possession of the true transmission of enlightenment would gain the upper hand. The position generally adopted in the later Seon schools, due in large part to the efforts of Jinul, denied claims of clear superiority of Seon meditational methods, but rather declared the intrinsic unity and similarities of the Seon and Gyo viewpoints. Although historical records mention all those schools, toward the end of the dynasty, Seon became dominant in its effect on the government and society, and the production of noteworthy scholars and adepts. During the Goryeo period, Seon thoroughly became a "religion of the state," receiving extensive support and privileges through connections with the ruling family and powerful members of the court. Although most of the scholastic schools waned in activity and influence during this period of the growth of Seon, the Hwaeom school continued as a lively source of scholarship well into the Goryeo, continuing the legacy of Uisang and Wonhyo. In particular the work of Gyunyeo (均如; 923-973) prepared for the reconciliation of Hwaeom and Seon, with Hwaeom's accommodating attitude toward the latter. Gyunyeo's works proved an important source for modern scholarship in identifying the distinctive nature of Korean Hwaeom. Uicheon stands out as another important advocate of Seon/Gyo unity. Like most other early Goryeo monks, he began his studies in Buddhism with Hwaeom. He later traveled to China, and upon his return, actively promulgated the Cheontae (天台宗, or Tiantai in Chinese) teaching, which became recognized as another Seon school. Historians describe that period as "five doctrinal and two meditational schools" (ogyo yangjong). Tragically, Uicheon alienated too many Seon adherents, dying at a relatively young age without seeing a Seon-Gyo unity accomplished. Jinul (知訥; 1158-1210) has earned the accolade of the most important figure of Seon in the Goryeo. In his time, the sangha fell into a crisis of external appearance and internal issues of doctrine. Buddhism had gradually become infected by secular tendencies and involvements, such as fortune-telling and the offering of prayers and rituals for success in secular endeavors. That kind of corruption resulted in the profusion of increasingly larger numbers of monks and nuns with questionable motivations. Therefore, the correction, revival, and improvement of the quality of Buddhism developed into prominent issues for Buddhist leaders of the period. Jinul sought to establish a new movement within Korean Seon, which he called the "samādhi and prajñā society", with the goal of establishing a new community of disciplined, pure-minded practitioners deep in the mountains. He eventually accomplished that mission by founding of the Seonggwangsa monastery at Mt. Jogye (曹溪山). Jinul's works embody a thorough analysis and reformulation of the methodologies of Seon study and practice. Jinul gave special focus to one major issue that had long fermented in Chinese Chan, the relationship between "gradual" and "sudden" methods in practice and enlightenment. Drawing upon various Chinese treatments of that topic, most importantly those by Zongmi (780-841) and Dahui (大慧; 1089-1163), Jinul created a "sudden enlightenment followed by gradual practice" dictum, which he outlined in a few relatively concise and accessible texts. From Dahui, Jinul also incorporated the gwanhwa (觀話) method into his practice. That form of meditation constitutes the main method taught in Korean Seon today. Jinul's philosophical resolution of the Seon-Gyo conflict brought a deep and lasting effect on Korean Buddhism. The general trend of Buddhism in the latter half of the Goryeo declined due to corruption, and the rise of strong anti-Buddhist political and philosophical sentiment. That period of relative decadence would nevertheless produce some of Korea's most renowned Seon masters. Three important monks of that period, contemporaries and friends, figured prominently in charting the future course of Korean Seon: Gyeonghan Baeg'un (景閑白雲; 1298-1374), Taego Bou (太古普愚; 1301-1382) and Naong Hyegeun (懶翁慧勤; 1320-1376). All three went to Yuan China to learn the Linji (臨濟 or Imje in Korean) gwanhwa teaching that had been popularized by Jinul. All three returned, and established the sharp, confrontational methods of the Imje school in their own teaching. Records state that each of the three had hundreds of disciples, making that new infusion into Korean Seon remarkably powerful. Despite the Imje influence, generally considered anti-scholarly in nature, Gyeonghan and Naong, under the influence of Jinul and the traditional tong bulgyo tendency, showed an unusual interest in scriptural study, as well as a strong understanding of Confucianism and Taoism, due to the increasing influence of Chinese philosophy as the foundation of official education. From that time, a marked tendency for Korean Buddhist monks to teach "three teachings" appeared. The production of the first woodblock edition of the Tripitaka, called the Tripitaka Koreana, stands out as a significant historical event of the Goryeo period. Monks created two editions, the first one completed from 1210 to 1231, and the second one from 1214 to 1259. Fire destroyed the first edition during an attack by Mongol invaders in 1232, but the second edition still exists at Haeinsa in Gyeongsang province. That high quality edition of the Tripitaka has served as the standard version of the Tripitaka in East Asia for almost 700 years. The Buddhist establishment at the end of the Goryeo period had become ridden with excesses. 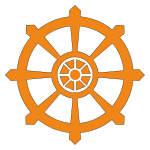 Too many monks and nuns practiced, a large percentage entering the sangha only as a means of escaping taxation and/or government service. Buddhism had far too many temples requiring support with too many elaborate, expensive, rituals conducted. The support of Buddhism had become a serious drain on the national economy. The government itself suffered from rampant corruption, while also struggling with wars on its northern and eastern borders. Moreover, a new and rapidly growing Neo-Confucian ideological movement of stridently anti-Buddhist inclination gained political power. In 1388, an influential general named Yi Seonggye (1380-1400) carried out a coup d'etat, and established himself as the first ruler of the Joseon dynasty under the reign title of Taejo in 1392 with the support of this Neo-Confucian movement. Subsequently, the government suppressed Buddhism gradually over the next 500 years, reducing the number of temples while restricting membership in the sangha. The government literally chased Buddhist monks and nuns into the mountains, forbidding them to mix with society. Joseon Buddhism, which had started off under the so-called "five doctrinal and two meditational" schools system of the Goryeo, first condensed to two schools:Seon and Gyo. Eventually, those reduced further to the single school of Seon. Despite that strong suppression from the government, and vehement ideological opposition from Korean Neo-Confucianism, Seon Buddhism continued to thrive intellectually. Giwha (己和emerged as an outstanding thinker; (Hamheo Deuktong 涵虚得通) 1376-1433), who had first studied at a Confucian academy, but then changed his focus to Buddhism, where Muhak Jacho (無學自超; 1327-1405) initiated him to the gwanhwa tradition. He wrote many scholarly commentaries, as well as essays and a large body of poetry. Being well-versed in Confucian and Daoist philosophies, Giwha also wrote an important treatise in defense of Buddhism, from the standpoint of the intrinsic unity of the three teachings, entitled the Hyeon jeong non. In the tradition of earlier philosophers, he applied che-yong ("essence-function") and Hwaeom (sa-sa mu-ae, "mutual interpenetration of phenomena"). Joseon scholar-monks often wrote on Hwaeom-related texts, as well as the Awakening of Faith, Sutra of Perfect Enlightenment, Śūrangama-sūtra, Diamond Sutra, and the Heart Sutra. The Jogye order instituted a set curriculum of scriptural study, including the above-mentioned works, along with other shorter selections from eminent Korean monks, such as Jinul. During the Joseon period, the number of Buddhist monasteries dropped from several hundred to a mere 36. The royal court placed limits on the number of clergy, land area, and ages for entering the sangha. The final restrictions prohibited monks and nuns from entering the cities, as well as Buddhist funerals and even begging, outlawed. Some rulers occasionally looked favorably upon Buddhism and abolished some of the more suppressive regulations. The most noteworthy among those, the queen dowager Munjeong (文定王后), a devout Buddhist, took control of the government in the stead of her young son Myeongjong (明宗 r. 1545-67), and immediately repealed many anti-Buddhist measures. The queen had deep respect for the brilliant monk Bou (普雨; 1515-1565), and installed him as the head of the Seon school. Buddhist monks part in repelling the Japanese invasion of general Toyotomi Hideyoshi, which occurred between 1592 and 1598, played a key role in the restoration of Buddhism to a position of minimal acceptance. At that time, the government suffered from internal squabbles, and initially lacked the strength to resist the incursion. The plight of the country encouraged some leaders of the sangha to organize monks into guerrilla units, which enjoyed some instrumental successes. The "righteous monk" (義士; uisa) movement spread during this eight-year war, finally including several thousand monks, led by the aging Seosan Hyujeong (西山休靜; 1520-1604), a first-rate Seon master and the author of a number of important religious texts. The presence of the monks' army was a critical factor in the eventual expulsion of the Japanese invaders. Seosan earned fame for continuing efforts toward the unification of Buddhist doctrinal study and practice. Wonhyo, Jinul, and Giwha strongly influenced his efforts. Scholars consider him the central figure in the revival of Joseon Buddhism, and most major streams of modern Korean Seon trace their lineages back to him through one of his four main disciples: Yujeong (1544-1610); Eongi (1581-1644), Taeneung (1562-1649) and Ilseon (1533-1608), all four served as lieutenants to Seosan during the war with Japan. The biographies of Seosan and his four major disciples have a number of similarities, and those similarities typify of the lifestyle of Seon monks of the late Goryeo and Joseon periods. Most of them began by engaging in Confucian and Daoist studies. Turning to Seon, they pursued a markedly itinerant lifestyle, wandering through the mountain monasteries. At that stage, they received initiation into the central component of Seon practice, the gong'an, or gwanhwa meditation. This gwanhwa meditation, unlike some Japanese Zen traditions, rejected contemplation on a lengthy, graduated series of deeper kōans. The typical Korean approach proclaimed that "all gong'an are contained in one" and therefore the practitioner, then and now, commonly remained with one hwadu during his whole meditational career, most often Zhaozhou's "mu." Buddhism during the three centuries, from the time of Seosan down to the next Japanese incursion into Korea in the late nineteenth century, remained fairly consistent with the above-described model. A number of eminent teachers appeared during the centuries after Seosan, but the Buddhism of the late Joseon, while keeping most of the common earlier characteristics, revealed an influence from a revival of Hwaeom studies, and occasionally by new interpretations of methodology in Seon study. The Pure Land (Amitābha) faith revived during the final two centuries. Although the government maintained fairly tight control of the sangha, the extreme suppression of the early Joseon never reoccurred. The Japanese occupation from 1910 to 1945 brought great suffering on the Korean people as a whole, and to the Korean sangha in particular, as the Japanese forced compliance with an extensive set of regulations. Japanese Buddhists demanded the right to proselytize in the cities, lifting the 500-year-ban on monks and nuns entering cities. The formation of new Buddhist sects, such as Won Buddhism, and the presence of Christian missionaries during this period led to further turbulence in traditional Korean Buddhism. The Japanese Buddhist custom of allowing Buddhist priests to marry contradicted the lifestyle of Korean Buddhist monks and nuns, who traditionally lived in celibacy. 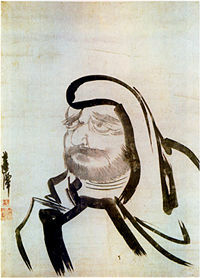 The Japanese occupational authorities encouraged that practice, appointed their own heads of temples, and had many works of art shipped to Japan. Negotiations for the repatriation of Korean Buddhist artworks are still ongoing. 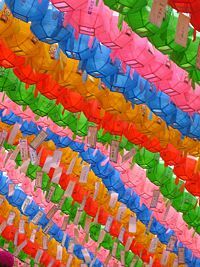 When the allies liberated Korea from Japanese occupation in 1945, the celibate ordained members of the main sect of Korean Buddhism, Chogye, began to take over for the married monks who ran the temples during the occupation. Starting in the 1950s, Syngman Rhee and others worked to further divide and weaken the Buddhist Sangha in the country. Rhee campaigned in 1954 against the so-called "Japanized Buddhists." Western education and scholarship, and the empowerment of women and the poor, caused divisions among Koreans. Specifically, a deep rift opened between married and celibate monks. The differences became so great that fistfights over the control of temples frequently broke out. Monks, mostly belonging to the Jogye order, threatened to kill themselves. Many of them stood against the Japanized Buddhists. As the Buddhist riots continued, the influence of Buddhism lessened. Buddhism continued to lose followers to Christian missionaries, who capitalized on those weaknesses. President Park Chung Hee unsuccessfully attempted during his rule (1961-1979) to settle the dispute by building a pan-national Buddhist organization. He succeeded in allying himself with the celibate faction of the sangha. In the 1980s, President Chun Doo-hwan used politics and intrigue to attack Buddhism. He sent troops to raid temples, and had hundreds of monks arrested and tortured. During the 1990's, conflicts between the South Korean government, Buddhist leaders and Christian denominations continued. The government accused Buddhist monks of immorality and some Christians used that to forward their missionary work. Some religious gatherings have even turned violent, with statues of Buddha and Dangun, the founder of Korea, being vandalized. The Seon school, led by the dominant Jogye order, practices disciplined traditional Seon practice at a number of major mountain monasteries in Korea, often under the direction of highly regarded masters. Modern Seon practice closely follows the content from the original practice of Jinul, who introduced the integrated combination of the practice of Gwanhwa meditation with the study of selected Buddhist texts. Itinerant life marks the Korean sangha: while each monk has a "home" monastery, he regularly travels throughout the mountains, staying as long as he wishes, studying and teaching in the style of whatever monastery houses him. The Korean monastic training system has seen a steadily increasing influx of Western practitioner-aspirants in the second half of the twentieth century. Currently, Korean Buddhism is in a state of slow transition. While Jinul's "sudden enlightenment, gradual cultivation," stands as the foundation for the reigning theory supporting Korean Buddhism, the Korean Seon master, Seongcheol's revival of Hui Neng's "sudden enlightenment, sudden cultivation" has taken Korean Buddhism by storm. Although some monks of the Jogye order resist the change, the last three Supreme Patriarchs' have taken a stance in accordance with Seongcheol, gradually changing the atmosphere of Korean Buddhism. BBC News: World: Buddhist brawl in Seoul. Buddhism Under Siege in South Korea. The Seoul Times: Characteristics of Korean Buddhism. This page was last modified on 23 April 2018, at 15:48.